with walnut, as with other types of wood. Birch was generally a lighter color than walnut. 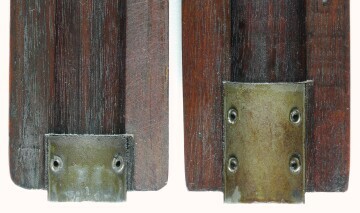 The width of the cuts at the front and/or back of the sighting groove sometimes varied by manufacturer. Inland and Winchester or for use as replacements. The majority of handguards have an angle along the top of the handguard that tapered slightly downwards as it approached the 90 degree cut at the front of the handguard (below top). 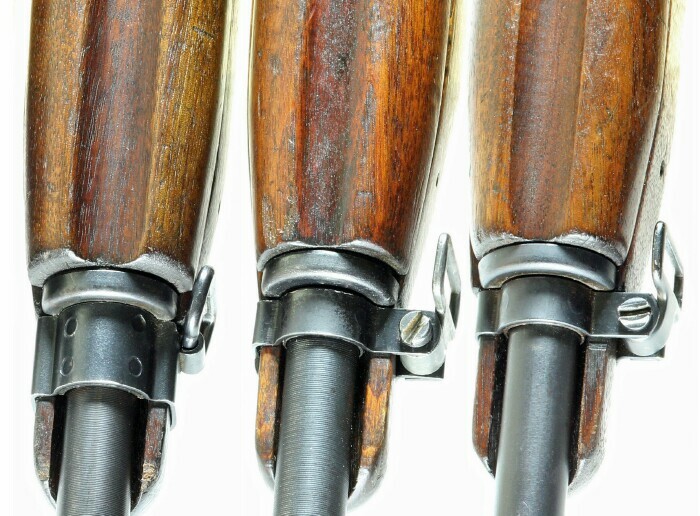 The taper downwards was slight on some of the handguards used by Winchester in 1943, creating a "bull nose" effect (above bottom). Some handguard manufacturer markings are obvious. Some are not. In this case the letters TN (top, towards left). Winchester used an easy to miss small W, though some of their early handguards had no marking. HI	 Hillerich & Bradsby Co.
HQ	 Hillerich & Bradsby Co.
Grand Rapids, MI	 Saginaw S.G.
SC-B	 Sprague & Carleton Co.
S-HB	 Hillerich & Bradsby Co.
TN	 Trimble Nursery & Furniture Co.
Trimble/TN	 Trimble Nursery & Furniture Co.
IBM BR-B Milton Bradley Co.
Inland HI	 Hillerich & Bradsby Co.
National Postal Meter TN	 Trimble Nursery & Furniture Co.
Quality Hardware HQ	 Hillerich & Bradsby Co.
Rock-Ola RMC	 Rock-Ola Mfg Co.
Standard Products S-HB	 Hillerich & Bradsby Co.
Underwood M-U	 Marlin Firearms Co.
Wood being wood it is subject to cracks. While a crack can happen anywhere in the handguard there were a couple places it was more prone to happen than anywhere else. usually starting at the front of the handguard. 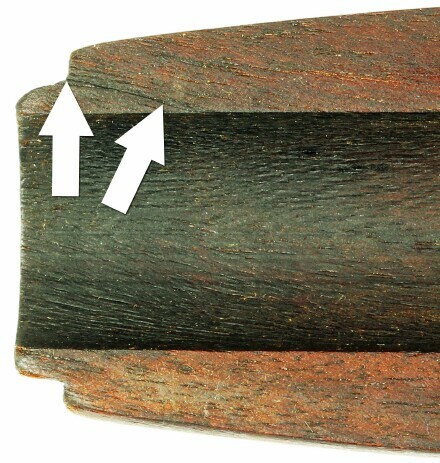 The most common place for a handguard crack is at the front of the handguard where the wood was thinner to accommodate the barrel band. These cracks can be difficult to spot without close examination of the bottom of the handguard at the front where the barrel band sits. This area is also prone to the wood chipping (have a look at the two handguards that precede the picture above). Should you have questions, assistance is available on our Discussion Forum. due to a lack of original documentation. A number of researchers and authors are present on the forums, helping others and seeking information for various research projects.